I always thought the aspirational target customers developed during consumer research were rather two-dimensional cardboard cutouts of imaginary people. 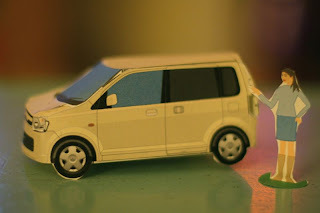 Fortunately, Mitsubishi felt the same and decided to create “Paper Craft” versions of their researched customers and pair them up with the appropriate vehicle. Make sure you checkout the numerous examples on Mitsubishi’s site. See them here. I personally love the black clad, dark grey shirt couple sporting the Lancer Evolution as their car of choice. I don’t know what your experience is but most Evo owners don’t look this cool. They usually are wearing a Sun Microsystems white t-shirt, khaki shorts, and Nike shoes. Oh well, it’s all about image and who really wants a cutout of some 35 year-old software engineer? I have to admit though I did enjoy playing with these and the kids really found them entertaining, even though, they couldn’t push a paper cutout across the living room floor at 15 mph. I recall years ago that Mini Cooper ran some print ads with paper cardboard cutouts in Wired magazine that I quickly punched out and put together on my desk at work. Yeah I’m a geek. Better get back to learning Ruby on Rails.